Michigan head coach Brady Hoke announced today that running back Fitz Toussaint and Frank Clark who plays defense for the Wolverines will miss the Alabama game. 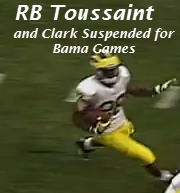 The strange thing is, Hoke listed Toussaint as the No. 1 running back on his depth chart, so we don’t know if Hoke is serious or just doing this for show. At this point, unless we see them both in a Michigan uniform tomorrow night, we are going to assume neither player will be in Dallas tomorrow night….but you never know.